Transportation planner David Maestas with a COMET van. Photo by Raquel Hendrickson. When the City of Maricopa formally unveiled its bus-stop shelters in October, there was a jump in ridership within a couple of days. “Attribute that to recognition that, yes, there is a transit system,” Transportation Planner David Maestas said. 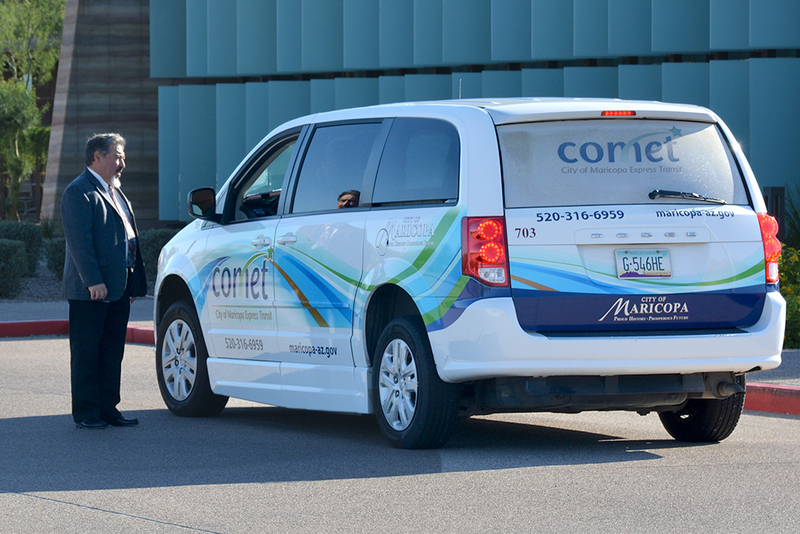 In fact, City of Maricopa Express Transit (COMET) has been around in one form or another since 2008. That it continues to lie below the awareness level of many Maricopans is a source of frustration and repeated questions about the operation of at least one aspect of the service. By the transportation department’s numbers, COMET had a ridership (individual boardings) of 7,344 during fiscal year 2017-18. That was an increase of 14.5 percent from the previous year. The projection for 2018-19 is 8,665, a continuation of a four-year increase. Those are budget numbers. The last time the city delivered a head count of “unique passengers” rather than boardings was FY 2015-16, when that number was 1,713. On the ground, the regional demand-response service (dial-a-ride) averages 8.6 riders per trip to medical offices in Chandler or Casa Grande. The 2018-19 budget for COMET is $354,000. The local share of that was $129,000 while federal grants pick up the bill for the rest. The projected number of trips to be taken during the same fiscal year is 8,665, making the per-trip cost to the City more than $14.84. Overall, the cost per-ride is $40.85. For riders, the cost of local demand-response is $1 per one-way trip. For regional demand-response, it is $3 per round trip. For the local fixed route, which is the service that uses the new bus-stop shelters, the fare is 50 cents per boarding. By comparison, in the tri-city area of Prescott a nonprofit operates the Yavapai Regional Transit that started as a municipal service in 2008. It is primarily comprised of three fixed routes. A one-way fare is $2 for adults and $1 for seniors, disabled and kids. The curb-to-curb, demand-response service is for seniors and individuals with mobility disabilities at a fare of $1; anyone else pays $5. For 2019-20, the requested budget is planned at $440,000, with the local amount due to be $169,000. The route-deviation service (fixed route) runs empty loops through the city some days. Getting more Maricopans aware of the service is one challenge; making them aware they need the service is another. “It takes people to change their habits,” said Chris Hager, director of TotalRide’s transit operations. The City contracts with TotalRide to run the COMET system. Hager said it is “probably the smallest” system his company operates, but it is just as important as systems in Phoenix, Avondale and Tucson. “We are very much in the process of increasing ridership primarily on the route-deviation service,” Maestas said. “That’s a careful process that’s best done slowly. Unlike the demand-response service, which picks up riders at a reserved time and place, the route-deviation service has 11 specific stops, some now with bus-stop shelters. The vehicles run from Fry’s to Bashas’, Pinal County Public Health Clinic and the Maricopa Public Library, Legacy Traditional School, Central Arizona College, Walmart, Harrah’s Ak-Chin and UltraStar, Copper Sky, Sun Life Health Center, Maricopa Meadows Park and Sun Life Women’s Center. While TotalRide wants to connect more of the demand-response riders to the route-deviation system, dial-a-ride is still necessary, even if fares need to be adjusted in the future. This story appears in the February issue of InMaricopa. Information has been updated to reflect corrections and recent numbers.